To contact us by email please send to info@icetime.org We would advise that this address is not constantly monitored so where urgent attention is required please telephone. The Ice Arena is on the first floor above Mecca Bingo and adjacent to the National Media Museum. Other nearby landmarks are the Alhambra Theatre and the Central Police Station. To find us follow signs for the City Centre or the National Media Museum marked "P" on the map. 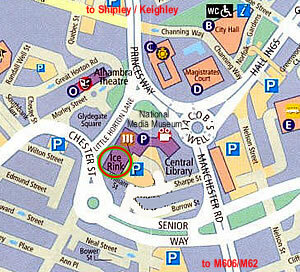 The Arena is also within easy reach of the Bradford Interchange (bus and trains). From the A1 travelling South continue onto the A1(M) and then the M1. Continue along the M1 until junction 42 to join the M62 West. Continue to junction 26 and exit onto the M606. From the M62 travelling West continue to junction 26 and exit onto the M606. From the M1 travelling North continue to junction 42 and exit onto the M62. Continue to junction 26 and exit onto the M606. From the M62 travelling East continue until you can join the M606. From the M606 continue and exit onto the slip road. At the roundabout take the third exit onto Rooley Lane (A6177). Turn right onto Manchester Road (A641) and continue. At the roundabout in the City Centre take the first exit onto Princes Way (A6181) and then turn left onto Little Horton Lane (A647). All content held within this website is copyright © 2010 Bradford Ice Arena and its licensors. All rights reserved.